Kent was very friendly, and most of all he started and finished the job when he said he was going to. I had Kent upgrade my electrical panel, put in new outlets, new GFCI outlets, and a bathroom exhaust fan. He arrived on Tuesday and installed a pigtail so I would still have electricity and worked for three days straight until it was done. He cleaned up the mess and did good quality work. His prices were also very reasonable, if not the lowest. I haven't had any problems and would definitely hire him again for any further electrical work. Thanks Kent! I personally will oversee the electrical work done on your home or business. Quality electrical work is often unseen, yet very important for safety. Proper grounding, making tight connections, and not leaving open splices are examples of quality work. You will have peace of mind knowing that your work is done right. Also, since I have a home office, my overhead is low, which means lower cost to my customers. Most of my work comes from repeat customers and referrals, which shows the high value I place on customer satisfaction. 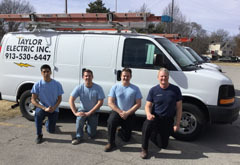 As a licensed and insured Kansas City electrician who aims for 100% customer satisfaction, Taylor Electric, Inc. is consistently striving to do a better job every time. Call us to and get your free estimate today!